v2.3.0 : Fixed some common issues. v2.3.0 : Translated in English, French, German, Spanish, Italian. v2.2.3 : Fixed some issues for more stable. v2.2.0 : Fixed some issues : shows the message on email, problem on multi currencies. Customers can spend gift cards themselves or present them to friends with 'Merry Christmas', 'Happy Birthday' or any other greeting messages via email! 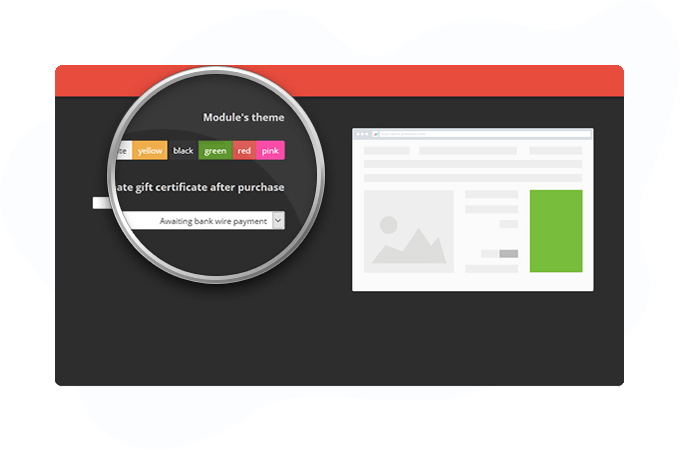 Defining products from your catalog to be used as gift certificates in the Prestashop BO. Any product can be used as certificate. Gift codes are generated automatically. Gift code can be redeem once. If the gift amount is not enough to cover the purchase the rest can be covered via credit card or checkout methods. No matter who the gift is for, it will be easily delivered to e-mail address. No need in extra codes, complicated actions, or rules to get the certificate – just few clicks and the product is ready to be purchased.